The Serrated Tactical Assassin Swordhas a unique yet tactical appearance. This full tang blade is coated black 440 stainless steel with eye-catching design. When you look at the blade you immediately notice the cutouts and serrations. These enhancements lighten the blade and combine with the black color to provide an awesome sleek and fantasy look. Black paracord is wrapped around the handle for a secure grip and easy maneuvering. 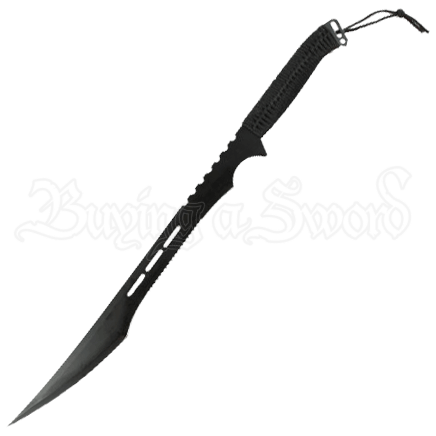 Included with this attractive weapon is a nylon sheath, ideal for its protection and storage. Add this attention-grabbing blade to your arsenal today!